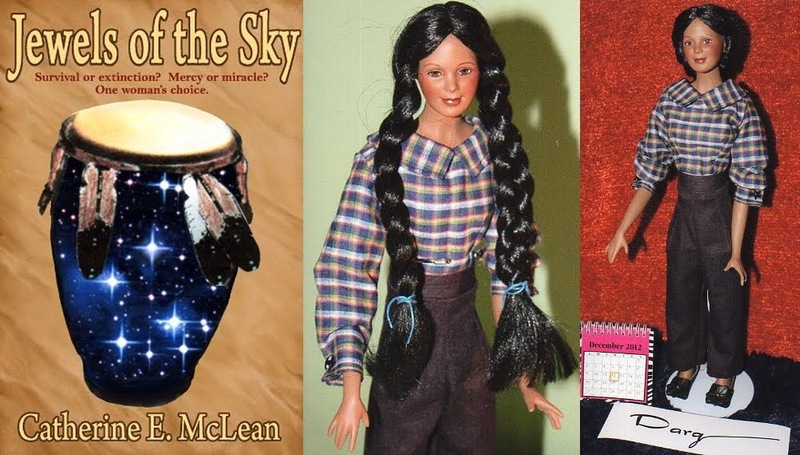 Today author Catherine E. McLean takes over our blog to tell us about what she is passionate about these days. A novelist, her latest release is Revision is a Process (26 April 2017, Rimstone Concepts LLC, 122 pages), a Non-Fiction Self-Help book. What I Am Passionate About These Days? I have been sewing since I was seven years old. If you count embroidery, which was the first project my mother taught me to do, I was likely six going on seven. As to the sewing, I grew up poor, but from a hard-working family who had a greenhouse and made their living growing tomatoes for market. Back then, I was able to buy four yards of fabric for a dollar. Oh, how times have changed! Now, my mother didn't sew, but she cashed in on my desire to sew and gave me her treadle sewing machine. In those days, my clothes cost pennies compared to purchased ones. I joined the Jefferson Dainty Stitchers 4-H club and went on to become its leader. When I married, I moved to Pennsylvania and started a sewing 4-H club. In 2016, I retired as a 4-H leader having been part of some 350 kids' lives. All though those years, I also competed in the sewing divisions of whatever fairs were near where I lived. Sadly, in all the years, none of my sewing ever took a Grand Championship. That's because the Grand Champion is chosen from all of the needlework departments. That means the sewing has to be outstanding enough to beat an afghan, crewel pictures, quilts, knitting, and crochet work, and so on. My passion for sewing now includes costuming for a 18.5" fashion doll. You see, two weeks after the publication of my sci-fi adventure (space opera) novel Jewels of the Sky. I found a doll named Raven. She looked like Darq, the book's starfighter pilot. Call it kismet, but Darq's pilot name was Raven! The premise is that Darq is visiting me here on Earth as an ambassador from her homeworld. Since she gets invited to all sorts of events, I sew her wardrobe. I've created Erte- and movie- inspired outfits, her uniform, her native Indian ceremonial dress, etc. Sewing those clothes is not an easy task since all I have to go on is an artist's sketch or a picture from a book or I see something interesting at Pinterest. The most challenging outfit so far was the Erte-inspired wedding cape-dress. It's 1.5 yards from the center back hem to the ends of the front pieces. I also do the backgrounds and props for the pictures. Oh, and one thing I discovered about Darq is that she is a shoe-aholic. She loves shoes. Every outfit comes with new shoes. If you'd like to suggest an outfit for Darq, post a comment here or at my blog. Good morning! 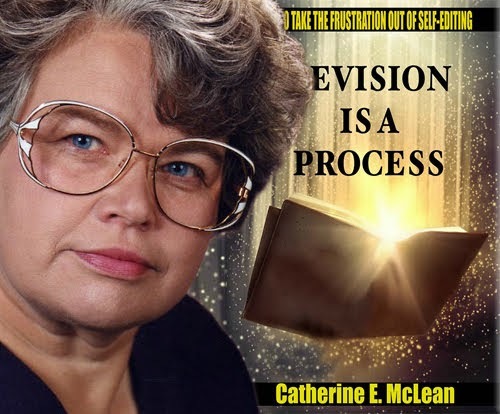 Thank you so much for featuring Revision is a Process today. I'll be stopping by periodically throughout the day to answer questions and chat either about the book or about my passion - sewing! Hello Catherine! Thank you for popping by! It's a pleasure having you here with us today. I have just finished adding a few pictures to complement your post - wow, I am blown away by the detailed work you put into Darq's clothing. Truly amazing! The steampunk outfit is out of this world! The layers of clothing are absolutely amazing. Yes, the October 2016 Halloween Steampunk Outfit was something else. The jacket is leather as is the corset. Those are real chains I hand sewed in place. Bent a couple needles doing it too. Thankfully Darq is an 18.5 inch doll and so sewing for her is a whole lot better than if she were a Barbie doll. I'm pretty lucky to have Darq. Because of her, I get to indulge my three hobbies: sewing, photography, and crafting. Alas, times have changed so that buying clothes is cheaper than buying the material. But, keep sewing. Darq's cape wedding dress, so stunning and warm, belongs in a princess Disney movie. Hello Janet! Thank you for visiting us today. Yes, times have certainly changed. One of the advantages of sewing my own things is that they are one-of-a-kinds. Makes me feel a little unique. And thanks for thinking Darq's cape-wedding-dress deserves Disney princess status. Did you know that on her homeworld, Darq is a princess? She's got a couple of titles too. Well, here in the USA where I live, the day has come to an end. Thank you Flora for having me as your guest today and taking the time to share some of my sewing projects with our followers. And thanks to all who stopped by just to look in. To those who commented and entered the raffle, I wish you all the best in life. Good night.